I wanted to participate in this year's Asylum Jam, but unfortunately it didn't quite work out as planned. Afterwards, I had horror games on my mind. 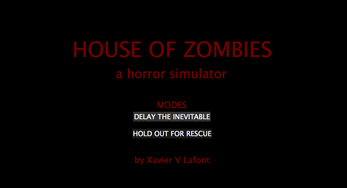 I started wondering if it's possible to make a horror game which is not story based. Can a game be scary by its mechanics alone? So I tried to make a game as an answer to that question. The game is nothing but mechanics, with a very basic premise established with a few lines of text. Then you're on your own! You control a family of 4 whose house is suddenly beset by a herd of zombies. These are old zombies though: slow and dumb. 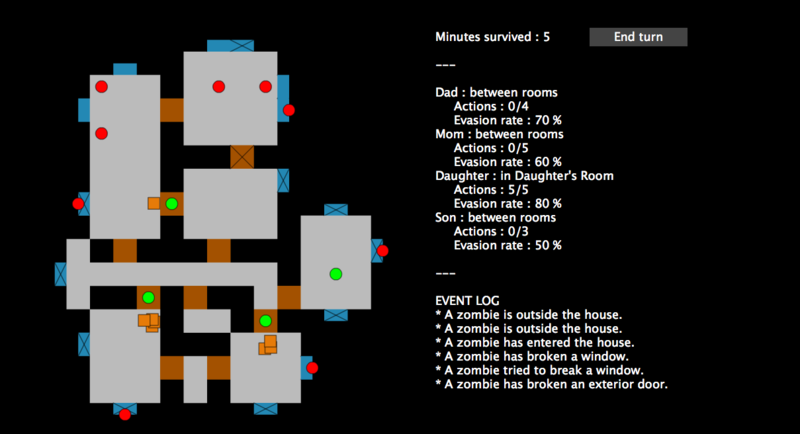 Move your family members around the house, close doors and barricade the rooms, and see how long you can survive. 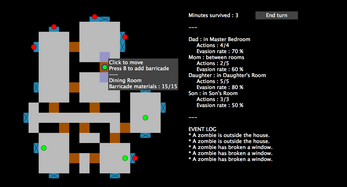 Something interesting I found out while working on a fog of war mechanic is that it cut out a lot of the tension. By default, you can see where the zombies are throughout the house, and I think that's more stressful than not being able to see them. So I removed the option of fog of war. Lesson learned: fog of war isn't always an interesting mechanic to have. It was quite fun to make a turn-based simulator around a horror theme. Hopefully it succeeds in making players feel anxious and helpless! Weird! Was this in your first playthrough?